Barn Buddies: Thoroughbred Or Terrier? 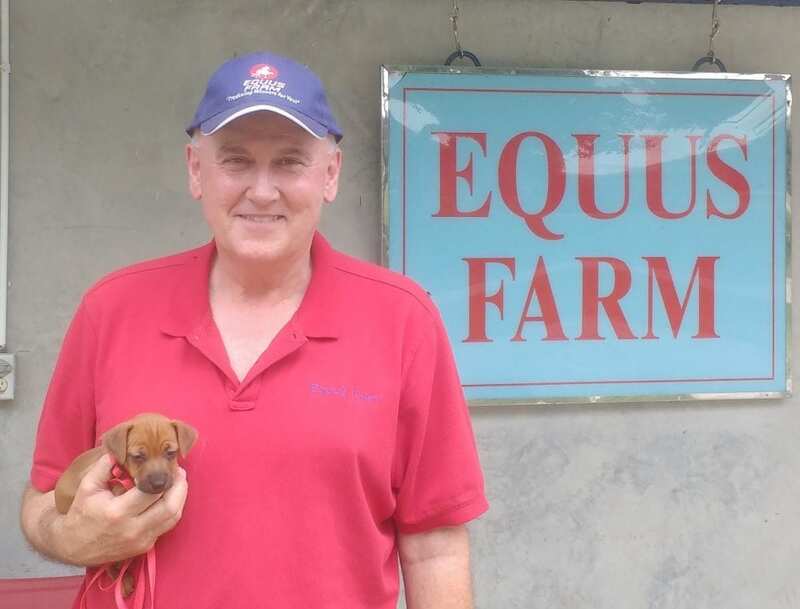 When people dropped by the Equus Farm consignment in Barn 8 at this year's Fasig-Tipton July sale in Lexington, Ky., they had a choice not offered at most consignments: do you want to buy a Thoroughbred, or do you want to buy a puppy? Paul Adams, half the team behind Equus Farm, has been breeding Jack Russell Terrier and Doberman puppies since the early 1980s. The dogs in the kennel attached to one of his barns at Equus are Adams' fourth generation of Jack Russells. At this year's sale, Adams brought five puppies to the barn at the start of the weekend. By late Tuesday, there was just one little female pup playing in the grass as the Equus team loaded up their signage and stall fans, and she was spoken for. Adams has sent Jack Russells all over the country and all over the world and has had several repeat customers who come to love the breed as much as he does. A few weeks ago, he received a call from an anesthesiologist in Boston who had met one of Adams' puppy graduates and wanted one of her own. She was calling him from the hospital because a surgeon had seen pictures of her new puppy and wanted a Jack Russell, too. Several years ago, a group of Japanese buyers came by one of Adams' barns during Keeneland September Yearling Sale to look at horses. One of them became enamored with a female puppy and wanted to take her home. At the time, the puppy was too young to legally travel, so Adams made arrangements to get all of her vaccines, do quarantine, and prepare her for export. When the time came, he called the buyer and asked about travel arrangements on a commercial cargo flight. Adams agrees the puppy landed the jackpot with that home. A retired math teacher, Adams said he didn't plan to become a dog breeder. Adams' breeding program is centered on European Jack Russells and Euro mixes. European Jacks do not look significantly different from typical Jacks in their physique, but are solid colored, unlike standard Jack Russells. Adams estimates he sells 30 to 40 puppies per year and it's perhaps no surprise his family and barn staff all have Jacks of their own. Everyone agrees once you've had a good Jack Russell, it's hard to switch to another breed. Jacks are high energy, excellent mousers and rat catchers, and one Equus staff member said his Jack has for years alerted him anytime a horse in the barn is cast in its stall. They're also an extremely confident breed; so much so, Adams said his Jacks usually boss the Dobermans around if given the chance. Adams has also found them to be good dogs for children; he recalls his niece used to enjoy dressing up the puppy she had as a child. The puppy didn't mind much until the day the child, unbeknownst to her parents, carried him off and dressed him up as The Tin Man – in a costume entirely made of duct tape. It took two people two hours to disentangle the puppy, but he was no worse for wear. 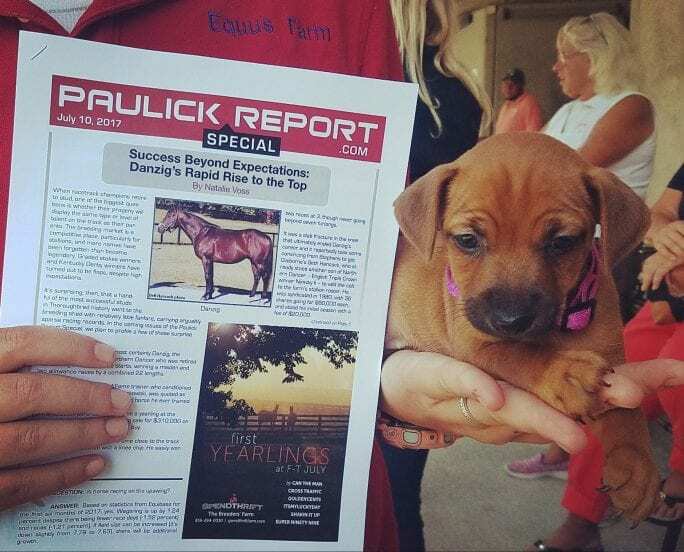 This entry was posted in Barn Buddies, Horse Care, NL Article and tagged equus farm, european jack russell terriers, fasig-tipton, jack russell terrier, paul adams, puppies by Natalie Voss. Bookmark the permalink.